Lady Mary Maclean, Patron of Clan Maclean Atlantic (Canada) and wife of our Chief, Sir Lachlan Maclean, passed away on Sunday, December 30th, 2007 in Scotland. She was very involved in the operations at Duart Castle, in particular "Lady Mary's Gift Shop and Tea Room". Her other community involvements included the Red Cross, the Cub Scouts, Children First (i.e. National Society for Prevention of Cruelty of Children), her own Nursery School at Arngask, the Old Folks Association, and the Community Council of Glenfarg. The Service of Thanksgiving will be held at St John's Episcopal Church, Princes Street, Perth, on Wednesday 9th January. Messages of condolence can be mailed to Sir Lachlan Maclean, Arngask House, Glenfarg, Perthshire, PH2 9QA, Scotland. At the request of the family, there are to be no flowers or wreaths, apart from the family flowers. As a fitting tribute to our Patron, our Association will be making a donation to the Clan Maclean Heritage Trust in Lady Mary's name. If individual association members wish to contribute to this donation, they may send their contributions to Nancy MacGregor (our Treasurer) at 44 Meadow Park Drive, R.R. #4, Amherst, Nova Scotia, B4H 3Y2. Deadline date for such submissions will be January 25, 2008. It is with great sadness that we heard the news of Lady Mary's passing. This was a sad ending to a great year for Clan Maclean Atlantic (Canada), especially since our Association has a unique relationship with Lady Mary, as she has been our Patron since 2005. It was a great pleasure for Betty and I, along with members of Clan Maclean Atlantic, when we had the opportunity to meet Lady Mary at a luncheon in her honor this past spring in Tobermory. I believe that she fully enjoyed her time with us, as we did with her, since she remained rather late in the day considering she had so much to do for the Gathering which was going on that week. On behalf of all Clan Maclean Atlantic members, I send our condolences to our Chief, Sir Lachlan, and all his family at this time. The first time that I met Lady Mary was at the Maclean Clan gathering on Mull this spring. Our Clan Association had extended an invitation for a luncheon to her and Sir Lachlan which they both graciously accepted. Right away you feel at ease. The warmth and genuine interest in each one that was in attendance was evident. I know that she had many things that needed her attention for the gathering and planning a wedding at Duart Castle that week, but you would have never known that as she provided us with her undivided attention. It was nice to meet her and know that she was as down to earth as you and I. 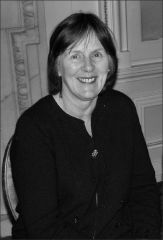 It is with great sadness that we learned that our Patron, Lady Mary Maclean has died. 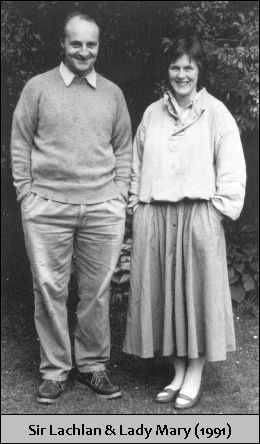 Her husband, and our Chief, Sir Lachlan asked Colonel Donald Maclean (Scotland) to personally�inform our Association of the sad news, as he was very aware of our special relationship with her.� She died on 30th December at her daughter, Emma's, home. Lady Mary and the Chief had spent Christmas with Emma and, fortunately all her immediate family were with her at the end. 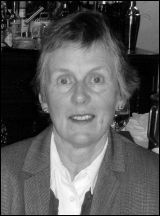 Lady Mary had been courageously battling cancer since the summer of 2006, and had endured two separate rounds of chemo. The first round seemed to be working, but the cancer returned. Experimental chemo was then tried, but unfortunately it was both extremely hard on her, and was not helping. At Lady Mary's direction this chemotherapy was discontinued. She learned, just before the Gathering, that her cancer had returned. She requested that Sir Lachlan let those of us (from our Association) who were hosting her for lunch in Tobermory, know that this was the case and that she did not want us to be asking her about her health. She wanted to, AND DID, keep the luncheon upbeat. He also suggested that perhaps she might only stay a short while as she tired easily. They stayed for over three hours, and Sir Lachlan told us subsequently that she decided to stay because she was having so much fun. We were so lucky to have had this chance to really interact with her, and I know it is a luncheon that none of us will ever forget. Mary Maclean was an exceptional woman. She was beautiful, spunky, bright, and gracious. The Chief was always the first to say that he was a very lucky man to have such a partner. And partner she was. Although born into the proud Highland Gordon Clan, she shouldered many of the onerous duties of maintaining, and improving Duart. Visitors, and even Clan members often do not realize that maintaining Duart Castle is a costly, and never-ending struggle. In 1990 Sir Lachlan became the 28th Chief, and he and Lady Mary assumed these responsibilities with all their considerable energies. Right from the beginning Lady Mary took on her share and more. Sir Lachlan said in an interview at that time that "We have already changed the display at the top of the Keep... - and in this connection, Mary has done a magnificent job going through old papers and albums we discovered at Duart". We are fortunate to have this wonderful example of an intact, historic, clan castle that Sir Lachlan and Lady Mary work/worked so hard to keep for us. Lady Mary herself directed the operation of the Gift shop, the tearoom, and also was heavily involved in updating exhibits, and arranging special events. All this to the benefit of our clan family! Despite being a person who was essentially shy, she graciously hosted many Clan events, and association meetings. She also ably assisted Sir Lachlan in providing the unique atmosphere that Duart is famous for. In a recent article in SCOTS magazine, Bruce MacWilliams says, "The presence of Sir Lachlan and Lady Maclean ensures that Duart Castle is one of the friendliest and most welcoming of all the castles in Scotland". I was privileged to have met Lady Mary on a number of occasions going back over a decade. During my tenure as President I had occasion to talk with her in person, and on the phone, on quite a few occasions. She was always gracious and self-effacing; with a wonderful dry sense of humour. I remember particularly when I called to ask her if she would be our Patron. I first talked to Sir Lachlan to see if he thought this was a good idea. His quite typical response was, "Well I don't know if she would want to take this on as she does not like the limelight, but you will just have to ask her yourself!" She actually wondered why we would want her to be Patron, thinking there must surely be more important people to have! When assured that we would be most deeply honoured if she would accept, she did so without any hesitation. We were fortunate indeed. I was also very proud when she described our new Clan flag - that we had worked so hard on - as "brilliant". She always paid attention to what we were up to. I know we all want to join Murray in extending our most sincere condolences to our beloved Chief and his family. She will be greatly missed. There are times when someone enters your life for a short period of time, yet they make a great impression and leave behind cherished memories. You feel sadness when you realize they will no longer be here. That is how I feel with the passing of Lady Mary. My first impression on meeting Lady Mary are the same as at our last meeting. She was very gracious and helpful, going out of her way because I am a MacLean (like her, by marriage). In May 1997 while visiting Duart Castle we met Sir Lachlan and spent time chatting with him. The next day we were leaving early but my husband, Ian, wanted to buy something from the Gift Shop at the castle that he had forgotten to get. He called the castle and spoke with Sir Lachlan who said Lady Mary would open early and for us to come. She met us at the Gift Shop and after conducting the business, we chatted and then went on up to the castle with her as the Chief was going to sign a book for Ian as well. She and I had a chance to chat about a number of topics, one of which was the tartan drapes in the castle. I had a number of questions and since she did not have that information at hand said she would write. I thought that was a kind thought but did not expect that I would hear from her. After all, thousands of people go through the castle and we were just two of many. She and Sir Lachlan graciously saw us off to the ferry leaving Mull. We were thrilled to have had the chance meeting and enjoyed our time with them. A month later I received a letter from Lady Mary. What a delightful surprise. 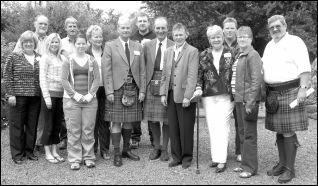 In 2002 we returned to the Isle of Mull for the International Gathering of Clan Maclean (our first such gathering). One of the special events was a reception at the castle for Friends of the MacLean Trust. I was astonished when Lady Mary came over, said my name, chatted for a few minutes and then asked how I had gotten along with my drapes. My husband at that time was President of Clan MacLean Atlantic and as such was invited to a get-together, with other Presidents, at the castle. It was at this get-together we found a number of "likes" in common, and I enjoyed passing time with her, which was all too short. Over the next year there was communication between my husband and Sir Lachlan as he was coming to visit with our members in 2003. Since we were hosting Sir Lachlan in our home, I communicated with Lady Mary to find out his likes and dislikes, as any host would. She was so easy with regard to my inquiries and indeed at times quite funny in her responses. Her sense of things became even more apparent to me when Sir Lachlan arrived, and after our first meal together he started clearing away the table. When I mentioned he did not have to bother, he informed that Lady Mary had given him strict instructions that he was to help out and make himself useful while with us. I had mentioned to Sir Lachlan that I was Irish and that being married to a MacLean that I often had to fight for space in our home, or be overrun by all things MacLean. He laughed and told us that Lady Mary often "suffers" from the same feeling, and that is why she often carried a bit of Gordon tartan in her pocket when going to MacLean events. The next time she called, I mentioned this exchange and we laughed about what we had to do to hold on to our own roots, being married to Maclean men. Our last encounters were at the Gathering in 2007. I was involved in setting up the Kirkin' O' The Tartan and had left some arrangements until I arrived on Mull. I needed a caterer and even though the Tea Room had not done this before, Lady Mary said she would arrange it for me - again gracious and helpful - and a load off my mind at the time. The evening before the Association's luncheon with Lady Mary, Sir Lachlan informed Ian and I that she had just received word that her cancer had returned. My first thought was we would cancel the luncheon but Sir Lachlan said she wished it to go ahead. The only thing she asked was that no one talk about her health; as she wanted to set it aside for the week of the Gathering. He also said that she might not stay long as it would depend on how she felt. The next day she greeted us all with a smile thus setting the tone for a wonderful afternoon. We all talked and above all laughed and enjoyed one another's company. It was such a special day for all of us. The next day over lunch with Ian and I, she expressed how delighted she was to have had such a wonderful luncheon with us all - and she enjoyed the laughter most. She was small in stature but strong in spirit. Despite the fact that she was battling cancer, she never gave in to her illness and this was just another example of that. Everyone will have their own wonderful memories of Lady Mary - I wanted to share some of mine. Although the news of her passing immediately brought tears to my eyes, it soon gave over to a smile on my lips as I remembered my encounters with her. In these brief encounters, Lady Mary has given me beautiful memories of who she was to me. I so much enjoyed our conversations and my time with her. I will cherish and carry them with me always. A very great lady who stood strong beside her husband! Lady Mary had a friendly way of making you feel so at ease and comfortable. She ran the best tearoom and gift shop. She will be missed not only by her family, but all Macleans around the world. There is an intrinsic pride common to all men, and women, in being able to trace and honour one's ancestors. On Sir Lachlan Maclean's visit to Nova Scotia a few years ago, we "down home" Macleans were lucky enough to be able to show him around. We also began to get a glimmering of how down-to-earth this family was. He was always willing to break bread and commune with all clan members, whatever their station, and was completely amazed and touched by the warmth of feeling and high regard in which he and his family were held, as well as the trouble which clansmen had gone to in honouring them. When one is able to meet with and celebrate the gathering of the present generations of their noble past, the appreciation is all the keener. Such was the case when we attended the International Gathering of Clan Maclean on Mull in June of 2007. Thus when it was arranged that the Clan Maclean Atlantic (Canada) Association would not only meet, but also dine with Lady Mary, the patron of our association, in the company of Sir Lachlan, we could not contain our pleasure. There is always a certain awe, reverence and trepidation in the minds of we clan members when in the presence of the respected Heads of our Clan, and this occasion was no exception. Although we were acquainted with Sir Lachlan from his visit to Nova Scotia, and taken his measure as a true gentleman, to meet our patron was to be a further privilege. In the dining room of a charming private house which had been set up as a truly family restaurant, we all gathered and shared in the warmth, love and dignity of this most elegant and charming Lady. Her husband was content to sit with his wee dram and bask in his own pride in this wonderful woman. And share we did, ranging over every topic, and always with the feeling that we were at the kitchen table - at home, with our family. What was to have been one-hour luncheon extended to two, with the Landlord turning away further clientele with the mantra "this is a Maclean function" ...Two and a half hours, and then three... But it could have been but five minutes, for all too soon it was over, leaving us to wend our way back to our accommodations. We were replete from the luncheon, the uisge-beatha, copious wine and the spiritual satisfaction of having given birth to an everlasting memory, I am sure, for all of us. To have been able to enjoy Lady Mary's presence was special. To have been made to feel one of her family, even only for one visit, and albeit for a short time, will be something we can pass down to our families. Thereby to continue the strength and unity of the Clan wheresoever spread, whatever their circumstances in life, throughout the generations. We will miss you, Lady Mary. God has called one of his Angels home. What a Great MacLean. Knowing she was sick, she still carried the torch for all MacLeans at the gathering. I have nothing but respect for this Lady, Our Patron, Lady Mary. What a great Lady. Friendly, outgoing, and a great role model for me.